Truman can be used to build a "sandnet", a tool for analyzing malware in an environment that is isolated, yet provides a virtual internet for the malware to interact with. This is what has been stated in it's main site and I'm pretty interested in this tool especially for someone who has deployed mwcollect and nepenthes to collect malwares, apparently truman suits the need to analyze malwares or worms that being collected since mwcollect and nepenthes are used to collect malwares or worms that spreading across the internet automatically and truman is used to provide sandnet to analyze the behaviours of malwares or worms, I think they play well together as a complete suit to fill in the need of security analyzt or malware researcher. Writing PF and Snort rules - Syntax Identical? Writing Firewall and IDS rules now is part of my job where I have to write when there's a need. Before I have used OpenBSD which was three years back, I remember that I was using redhat linux-6.0/7.2 and had tried to finish the IPchain/IPtables documentations and I did, but I found myself kind of short memory which can't remember how to write a proper firewall rules without refering to the documentation or manual, IPtables is considered solid but the rule writing part seems to be cryptic and that's one of main reason why tools like firewallbuilder and etc getting popular because simplifying user/admin's job to get their job done on firewalling. They no longer need to learn IPtables in hardway. I do know those people who is IPtables hardcorer but remember it takes longer time to learn then it supposes to be, no offense on any firewalling technologies but I guess lots of people agree with me. I use linux, and yet I tried out OpenBSD which was 3.5, I manage to learn it quickly especially the configuration part for apache, ftpd and other services, however my main purpose of using OpenBSD would be running a security device since OpenBSD itself is secured by default. Since OpenBSD offers it's own firewall calls PF, hence I start learning it by reading the manual and the documentation in openbsd.org, quickly googling and learning how other people put the rules together, it seems that PF is much simpler and easy to understand, I'm now able to write PF rules file without much refering to it's manual and documentations, more fun as well since less headache on loading PF rules. Last year I start writing snort rules after joining new company, I have used snort since two years back but never write any rules till last year where I have to. At first it looks complicated but after a while you might feel comfortable since the tricky part would be how to write the rules that detecting the intrusions perfectly instead of it's syntax. Apparently either PF Firewall rules or Snort IDS rules are very human readable and you can quickly understand what it does or perform. Then I found out why I can quickly adapt to Snort rules writing since it is actually identical and similar to writing PF rules. Let's take a look at both rules writing structure. I'm always fascinated by Intrusion Detection System's technologies and there's one IDS that I would like to try for long time and haven't have time to play with it. I recall myself of trying to install Bro-IDS on OpenBSD 3.6 but having problem with that. Now I'm back to retry it again on OpenBSD Current. Surprisingly I have no problem to get it install at all, here's how I get it done which is straight forward. You need gmake and bison to get it compiled. It will automatically place all the symlinks to the proper directories to help you ease you work when you need to update next time. The installation part is done and the tricky part would be configurations and trying to understand how Bro-IDS works, RTFM time again. It shows the process info and who is currently login to the database. I have mentioned about snort2c previously in this post. Few things I would like to point out would be snort should be compiled with flex-resp in order to perform active response against the threat. Another thing I would like to share would be expiretable which is used to remove entries from the pf table specified by table. Again we look at what is snort2c, snort2c works monitoring snort's alertfile using a kqueue filter and blocking any attacker's ip that not in the whitelist file. It uses a (persist) table and a (block in) rule that blocks any access against our network. So it's all about pf table now, since snort2c doesn't has feature which auto flush the table's entry(in todo list of snort2c indeed), expiretable is what we need. Since it is in OpenBSD current port, I can just install it through latest packages. Now we can actually specify the age of the table entry to be flushed, it's useful where we don't have to remove the IP addresses that been blocked in the table but autoflush it after certain period, this may ease the job of manually removing IP from the table or maybe flushing the table. Add this line at the end of the file. So the expiretable will check on every 5 minutes and flushing snort2c table entries that last 30 minutes. The expiretable-0.6 is out and you may try out if you feel adventurous. I have found a interesting tool to monitor the network interface in the OpenBSD port recently - pktstat. The pktstat program displays a real-time summary of packet activity on an interface and maybe you are thinking of tools like ifstat and etc, however pktstat has it's own interesting features that not offered by other tool, let's check it out. One of the interesting feature of pktstat is that you can separate the network flow to view clearly about the total statistic of each connections via -c switch, else it will just show the streams of both sides in single line. 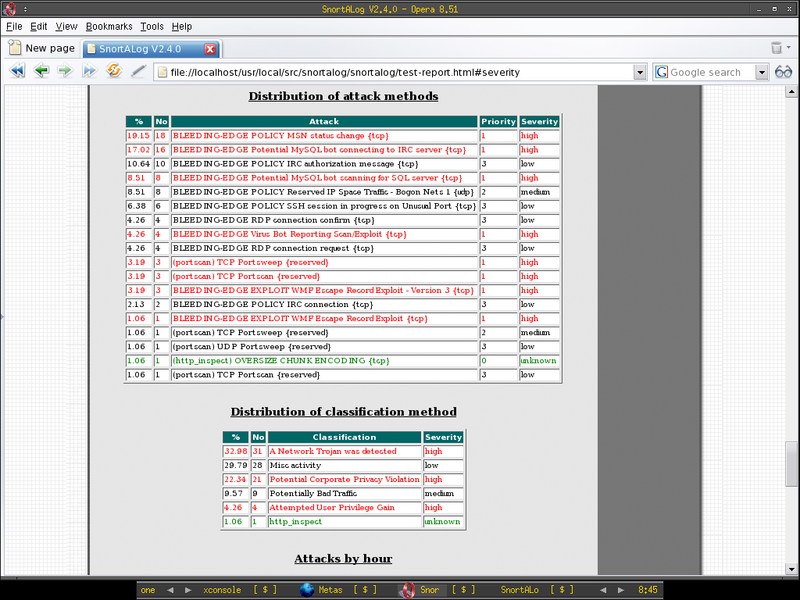 as well as showing the hosts that sending tcp packet contains syn flag. The last one I have added myself and I guess it's not hard to figure out how to write the abbreviation file. Pktstat by default searches the ~/.pktstatrc or specify in /etc/pktstatrc. You can suppress it by supplying -A none option. Since Chinese New Year is around, I have been really busy to get things in order, while trying to get jobs done, I have to prepare and buying ding ding dong dong for the sake of CNY. Time seems not enough at the moment, or should I say it's not enough all the while. I have just added sguil components startup on boot in /etc/rc.local so that you won't need to run that 6 scripts in ~ anymore. However I have only put it into my documentation instead of syncing it to the VMware Image since uploading is slow over here for around 100MB file. I blog it here instead of anyone interested. 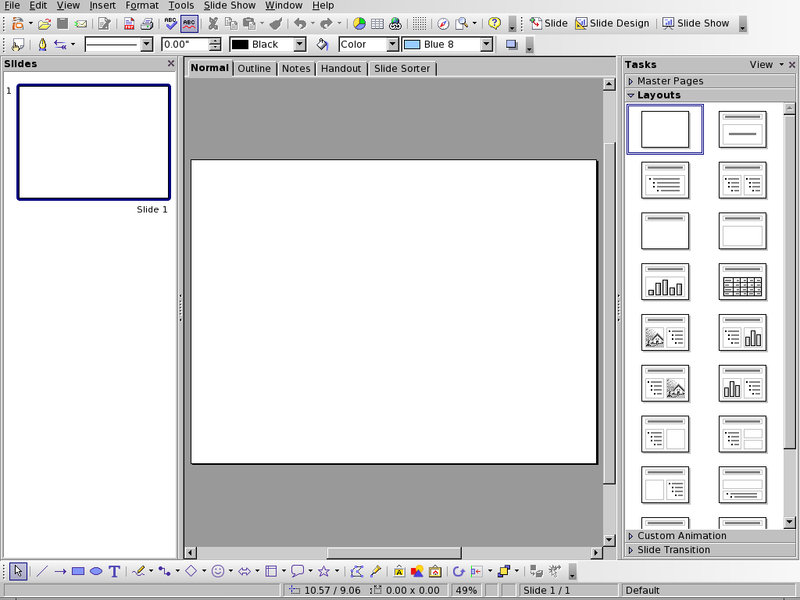 Just open the /etc/rc.local file, and append the lines below at the end of the file. Now all the sguil components will startup properly in order and directly you can connect to the sguil server using the client after reboot. There's a tcl script added to sguil which is not much be used yet - incident_report.tcl, it resides in /usr/local/stow/sguil-0.6.0p1/server/contrib if you use my Sguil Vmware Image, this script really fills the part of sguil where you can't generate a nice report for the incidents. Using incident_report.tcl, you can generate the report by just running the command below. 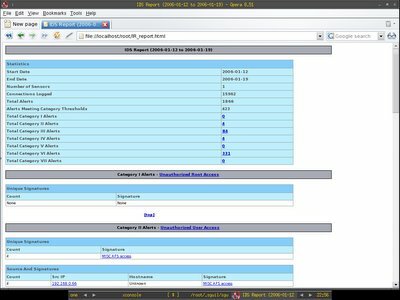 With that I have generated the IR_report.html and this is good since I guess most of the companies require you to send or submit reports when you are performing your task, that should be it. 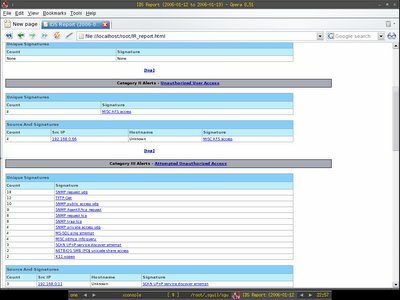 You can generate the html report by specifying the starting and ending date as well, however other options that you can define, I just leave it for you to figure out. I have tested Sguil-0.6.0p1 on OpenBSD current, everything seems go smoothly and the crash of mysqltcl gone. Thanks to the Mysql 5 ports which has really made deployment of sguil on OpenBSD easier. However one thing I notice would be tcpdump can't be run as normal user and requires root privilege, even after I have changed the owner of the tcpdump to other user, I still can't run it as that particular user, it can only be run as root. To workaround on this and not to change the binary owner in /usr/sbin, I decide to install tcpdump-3.8.3 instead of using native tcpdump in OpenBSD. 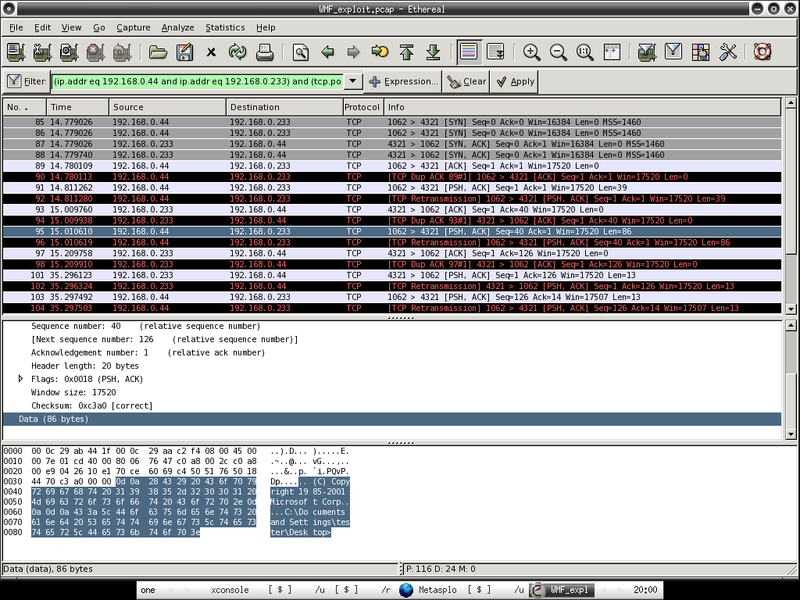 After all it works and I can run tcpdump as any users now to at least able to read and write the pcap file. Anyway here's little correction updates for the OpenBSD Sguil Vmware Image, for anyone who try it. - Barnyard pointing to wrong directory for sid-msg.map and gen-msg.map, this causes the snort rules not displaying in the sguil client analyst console when check on show rules, it supposes pointing to /nsm/sguild_data/rules/pcn1 instead of /usr/local/snortrules-pcn1 since /usr/local/snortrules-pcn1 is for sensor and /nsm/sguild_data/rules/pcn1 is for sguild to show's the rules. - Tcpflow is not installed, so it causes session data can't be generated. If you have internet connections, installing it is just a glance. I have heard about the Anonymous Live CD that using OpenBSD - Kaos, do you think it would be cool to have Sguil Live CD that using OpenBSD which allows you to mount /nsm to hard drive maybe? Previously I have installed Mysql 5 using source for my Sguil build, however now Mysql-5.0.18 is already in the OpenBSD Current Port. Thanks to Brad[at]openbsd.org who has updated it. This would ease my deployment of Mysql 5 on OpenBSD. You can install it via current port or checkout the cvsweb here. 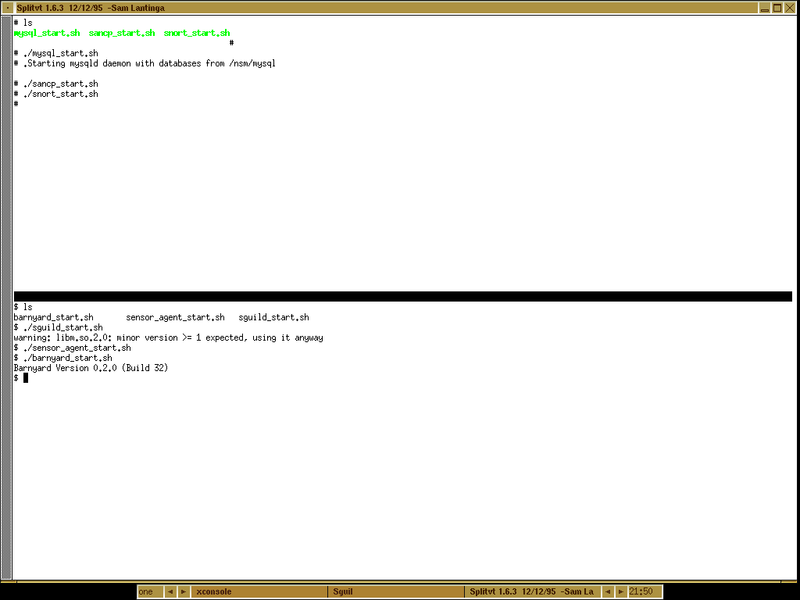 And I have the screen like below and easily I can run the scripts for both shells. Celebrating my 100th post of the blog with the OpenBSD Sguil VMware Image released, you can just download it from here and load it to your VMplayer now. This release without sguil client installed since I don't want to add X to it. It's about 410MB and I have compressed it using tar and gzip and it is around 105MB after compression. I will start testing Hanashi's InstantNSM and try to release Centos Sguil VMImage as soon as I have time in hand. 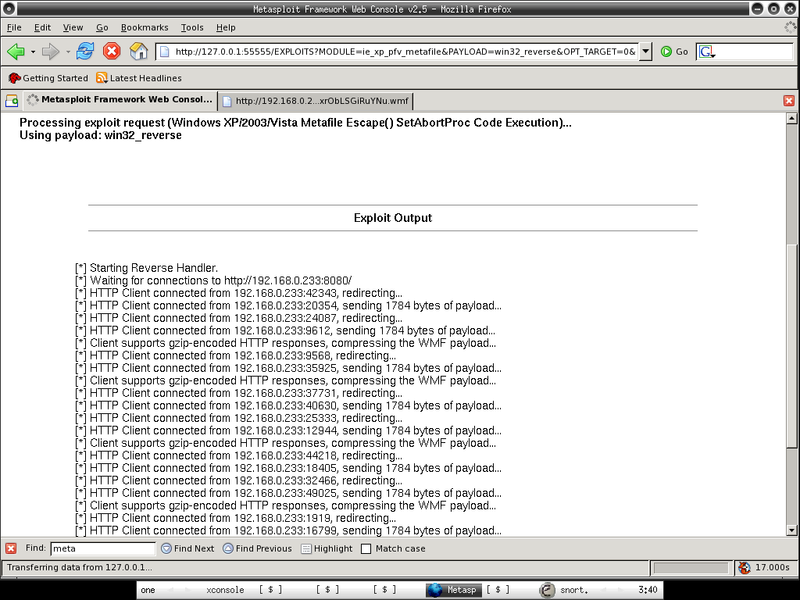 Below is the info of the OpenBSD Sguil Vmware Image. You will have to run Sguil server, sensor, barnyard, sancp, snort and mysql by hand, you just have to run the script in /root and /home/sguil, there are total six scripts and you have to run it in order. That's all, if you have any doubt about the Sguil VM, I do welcome any question and feedback. But NO SPAM, please!!!!! Hopefully I will be able to continue this blog with much efforts, improvements and benefits others. 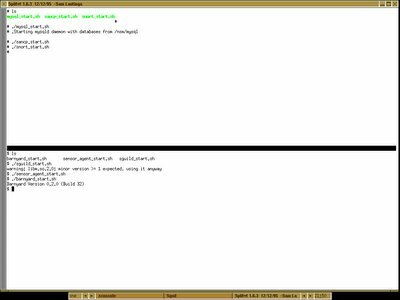 I have just finished my Sguil Installation Script for OpenBSD, it will automate the whole process of installation by running the script, I have uploaded it to here and you shall find the script's name is SguilOBSD_install.sh. However you still have to configure sguil manually, I wish I have time to work on automating sguil configuration as well. Just to remind that the sguil client installation script which is sguilclient_OBSD.sh is not compatible with SguilOBSD_install.sh, you shall install them in different machine since it's not a good idea to run sguil client in the same machine anyway. I have just uploaded the patched barnyard and patched sancp to this location as well, I call them as barnyard-0.2.0-patched.tar.gz and sancp-1.6.1-patched.tar.gz, if you are using my installation script and you want to patch barnyard and sguil yourself, you have to tweak my installation script yourself since the installation script is fetching these two files from my central source location. I have also created the tclx8.4.tar.gz and uploaded to the same location as well since I don't want to install bzip2 in my system to keep minimal packages installation since tclx only distributes it's file with bzip compression. I have also fix the minor erros in my installation guide. I'm kind of tiring now after working on OpenBSD Sguil stuffs, however it's worth to spend times on it and I hope you find it useful. This is considered late post since most of people out there should have already known this, however I just mentioned it here for the sack of Richard. Instead of connecting to sguil demo server, if you really want to try out and know how Sguil works, now you have Sguil Vmware image available here. 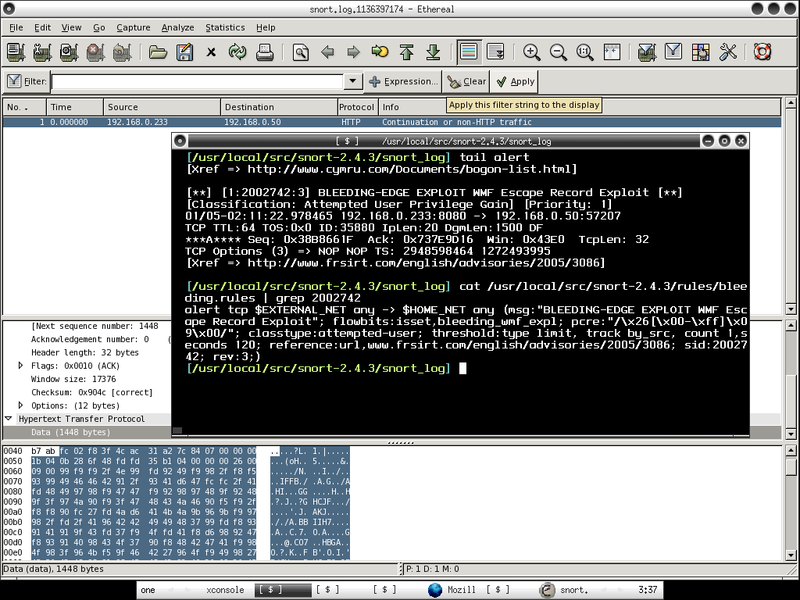 Sguil is deployed on FreeBSD platform and working properly. Insist I will try Richard's installation script as well as InstantNSM's installation script once I have time in hand. Scottder has put up my Sguil on OpenBSD guide at this location, thanks again to all the sguil lamerz and enjoy yourself at Shmoocon if you are there. By the way, I'm writing Sguil Installation Script for Sguil on OpenBSD to ease the deployment. Coincidentally, just one year after the released of previous Sguil-0.5.3 installation guide, I have the second one finished which is based on Sguil-0.6.0p1. I have uploaded it to http://www.dissectible.org/anonymous/Sguil_OBSD, please do feedback if you try it so that I can improve it from time to time. 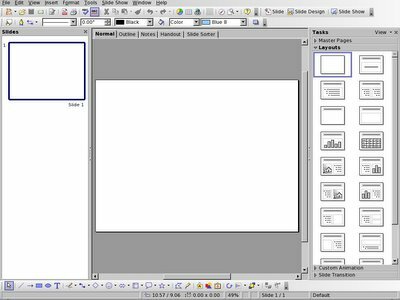 I decide to release in text, abiword, openoffice writer and pdf format, don't ask me why abiword format but I have used it to write this documentation. If you are preparing to deploy Sguil-0.6.0p1 on OpenBSD-3.8, I have uploaded all the sources that needed to deploy at http://www.dissectible.org/anonymous/Sguil_OBSD/source. It will serve as central location to ease your deployment. 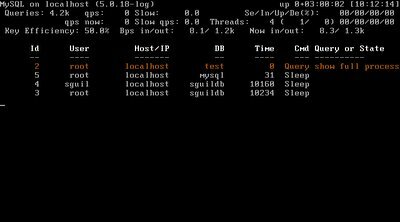 I have installed Sguil-0.6.0p1 on OpenBSD 3.8 with Mysql 5. It's painful process that I have gone through however it is finally finished. The documentation on how it can be done is in cleaning up process, again I will upload it to dissetible.org as long as I have it done, stay tuned :]. 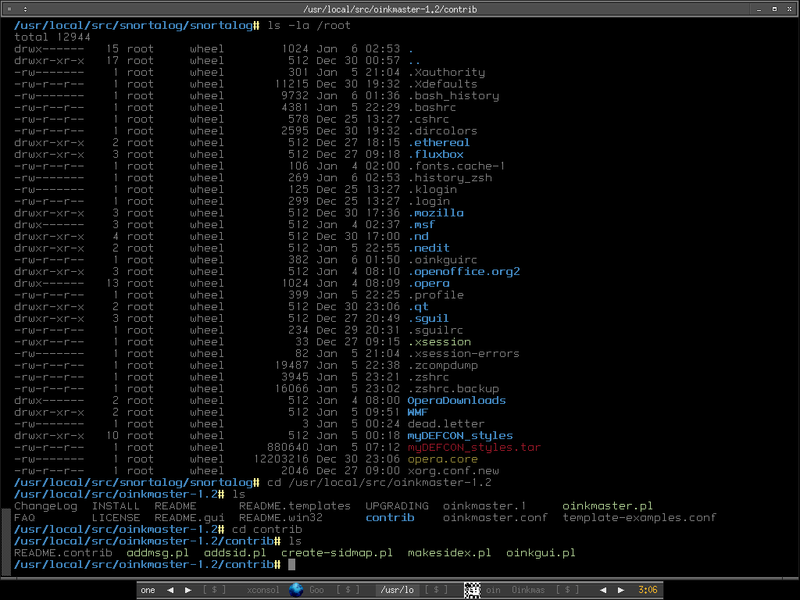 Below is the screenshot of my OpenBSD Sguil. There's one of the project in Bleedingsnort that I would like to try out - Snort-ClamAV, with the ClamAV preprocessors, it can scan the data stream that travelling across the wire for viruses, maybe it is not as useful as it seems since nowadays most of the host has personal antivirus software deployed, however it would notify and may drop the viruses/worms before reaching your client host in the network. Here's how I get Snort-ClamAV to work on OpenBSD current. You should add the ClamAV preprocessor before http_inspect preprocessor in the snort configuration file, I have renamed my snort configuration to snort_clamav.conf to reflect it's changes. If you are getting error where preprocessor clamAV not found, that most prolly is the cause of you haven't do autoreconf -f or --enable-clamav when compiling Snort-ClamAV. I'm pretty sure most of you find that snort is not well supported under OpenBSD, what I mean it is not well supported would be it is always lack of documentations on how we can run snort or snort related tools on OpenBSD platform. Here I will share with OpenBSD and snort users how I get Snortalog working on OpenBSD. Installing the needed dependencies for snortalog to work properly. Since HTML-HTMLDocis not available via OpenBSd port/package, I just download it. unknown option "accelerator" at /usr/local/libdata/perl5/site_perl/i386-openbsd/Tk.pm 247. 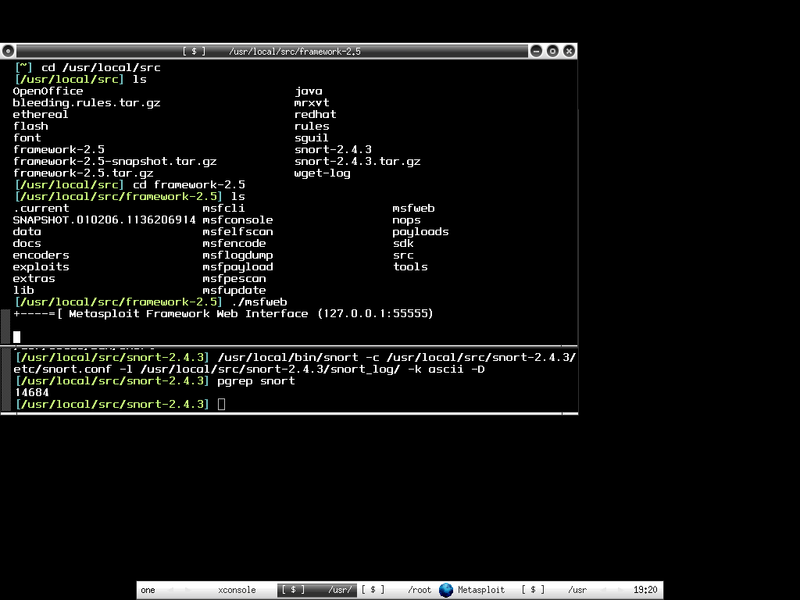 Since I'm not perl expert, directly I just download the perl Tk from cpan mirror site to install from source. 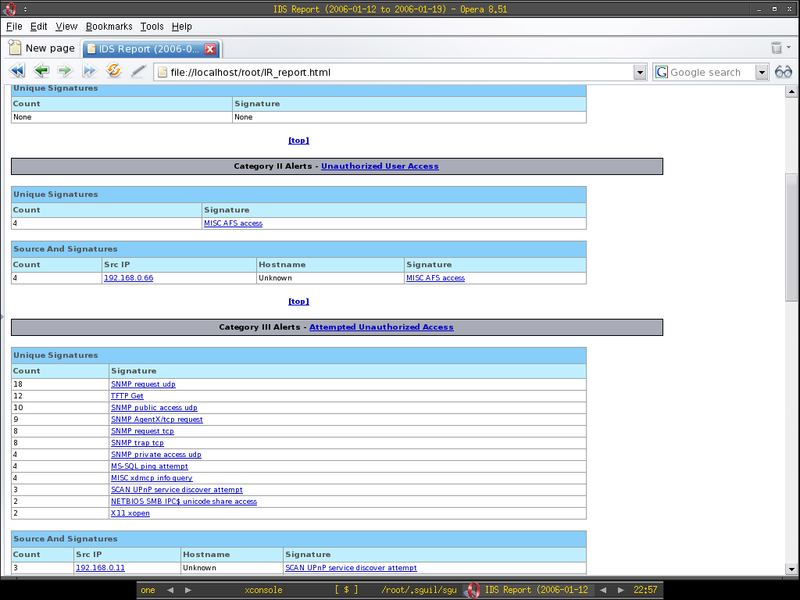 Snortalog GUI, you can generate report based on variety of options. This is the Ascii report that generated by loading snort alert file. 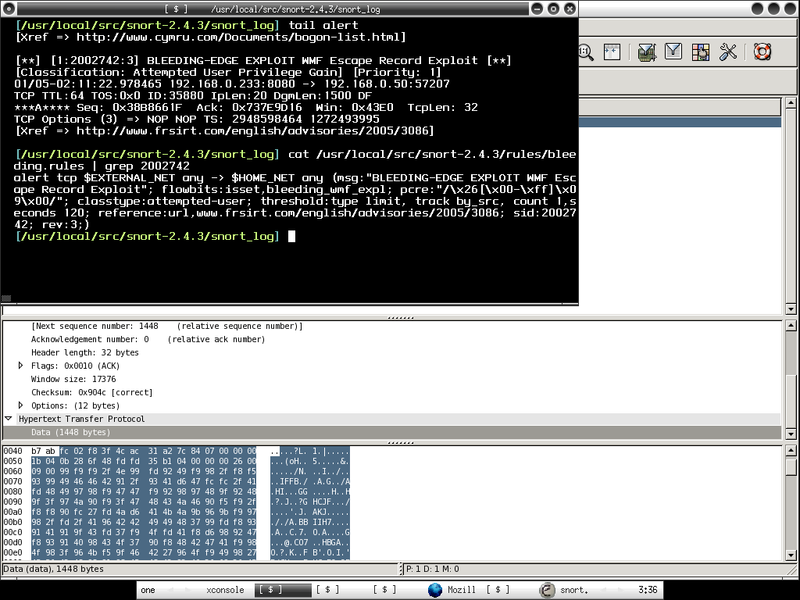 I'm pretty satisfy about Snortalog and it really suits my need when comes to analyze firewall and ids logs. If you snort user, and you like to stay cutting edge, bleeding-snort is what you suppose to try. Bleeding-snort offers the latest snort rule vs exploits/intrusions detected to date, it is double edged sword as at the same time it delivers the latest snort ruleset , it does offer you false positive as well since the ruleset is not tested heavily when outbreak period. However we would rather getting false positive instead of missing the detection of attacks when risk is out there somewhere since disabling snort rule never require a rocket scientist :P. Another thing I like about bleeding snort is that it does offer few interesting projects that related to snort which you can play around and implement depends on your network architecture and needs. 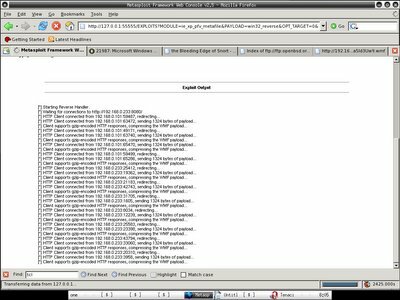 Msfweb is running and waiting for connections to http://192.168.0.233:8080, and you may notice session 1 started ... someone was exploited!!! There are connections from the victims, the first connection is not gzip-encoded, the rest are gzip-encoded. Back to the sensor that running snort with bleeding snort rule loaded, I smell something bad when I tail the alert file, then I load the fishy pcap file that it captures in /usr/local/src/snort-2.4.3/snort_log to ethereal, apparently it is just showing the single packet that successfully exploiting the vulnerable victim which is not gzip encoded when I try to run wget http://192.168.0.233:8080, the rest of it I just connect to http://192.168.0.233:8080 with different kind of web browsers including lynx as victims. You should see the matching snort rule with the SID of 2002742 and the payload in ethereal. 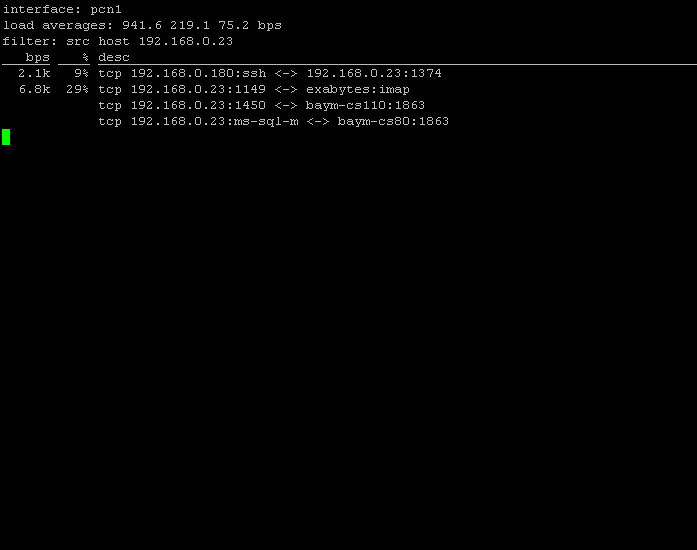 However do you really see the whole session of where the bad guys executing commands in your vulnerable host? That's where full content traffic data comes in hand when performing network forensic. Immediately I load the tcpdump log - full_trace.pcap to ethereal. Since I have snort rule detects that the src ip is 192.168.0.233 and the destination ip is 192.168.0.50(refer to screenshot 5), I can easily query it with the expression of ip.addr eq 192.168.0.233 and ip.addr eq 192.168.0.50 to trace the session between these two hosts. 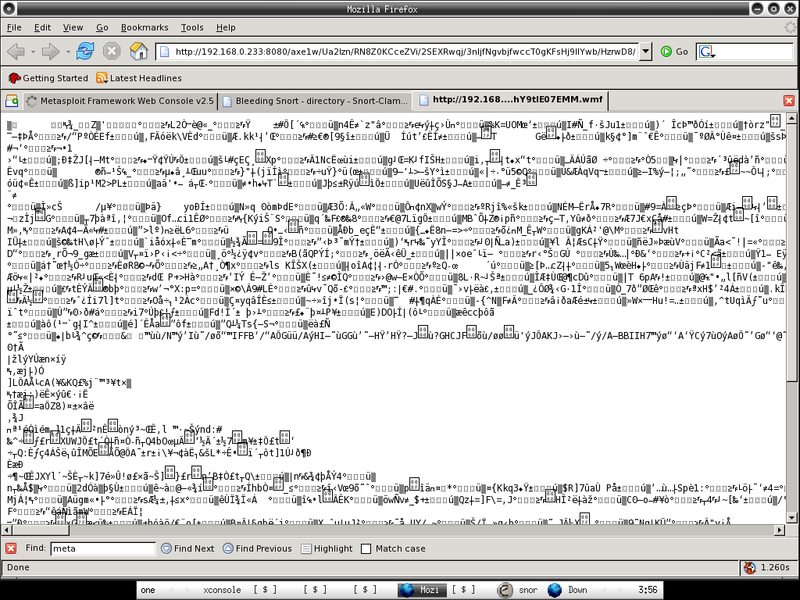 When I try to follow tcp stream to generate the transcript, everything is pretty obvious. You should understand perfectly what is happening and planning for countermeasure now. Apparently we can alway do more with less, the whole process requires more efforts and lacking of efficiencies. That's where Network Security Monitoring(NSM) comes into the place, if you have NSM model deployed, it wouldn't take that hard to perform incident response and handling or even network forensic, that's why NSM requires the interaction of security analyst. Network Security Monitoring(NSM) is the model that not only relies totally on the capabilities of Intrusion Detection System but a complete framework that utilizes the capabilities of security analyst, it is a must for the security analyst to fully understand what is happenning in the network as well as performing network forensic and investigation perfectly. 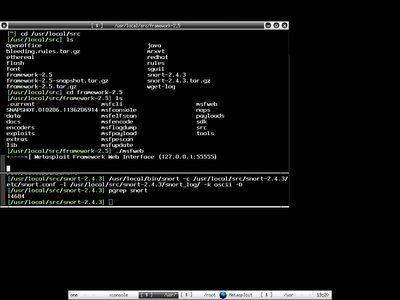 Previously I have shown how you able to have colorful shell on FreeBSD and now I have it on OpenBSD, you can easily configure it by installing gnuls from ports /packages, after you have installed it , just add one liner to ~/.profile or ~/.bashrc, depends on what shell you are using. You will have to configure the path manually, this should be easily done. Snort rules update successfully, one thing I like about it is that you can just click on Save current settings button and it will save the configuration to /root/.oinkguirc automatically. When I check on the ClamAV site today, it seems there is already signature for WMF exploits, I quickly install it through OpenBSD port and would like to give it a try since I'm thinking of trying on Snort+Clamav that available in bleeding as well. It will add a user _clamav automatically, then you have to configure the clamd.conf and freshclam.conf manually. Just copy the default one to /etc. You should be able to figure out how to configure it properly with this doc. After you have configured it, I suggest you run freshclam to update the signature database first since you don't have main.cvd and daily.cvd initially. I quickly scan /root/WMF by using clamscan, and apparently it works perfectly. You may see the result below. Why use commercial AV when there's effective and cool one available??!!! 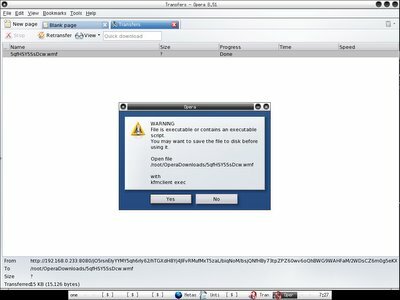 The current hottest security topic would be Windows Metafile Exploit, it is still considered 0 days since Microsoft hasn't released any patches until 10th of Jan. Considering all the windows users in the dangerous zone now especially those users who totally have no idea and lack of awareness. HD Moore has released the exploit and I think it's worth to give it a try, I know there are people saying HD Moore is totally irresponsible and not suppose to release it. However the name says it all - Metasploit, it just do it right :P.
Surprisingly I able to use Metaploit on OpenBSD without any problem, just download the latest Metasploit snapshot and untar it, everything is working properly and I just launched the web base Metasploit - msfweb and there will be port 55555 listenning on localhost. 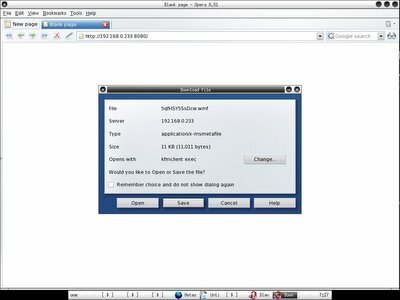 Then I connect to http://127.0.0.1:55555 and choose the windows metafile exploit, upload the the exploit code to localhost port 8080. Since my Ip is 192.168.0.233 on the evil host that running Metasploit, in the victim host, I just use my Mozilla Firefox browser to connect to http://192.168.0.233:8080. 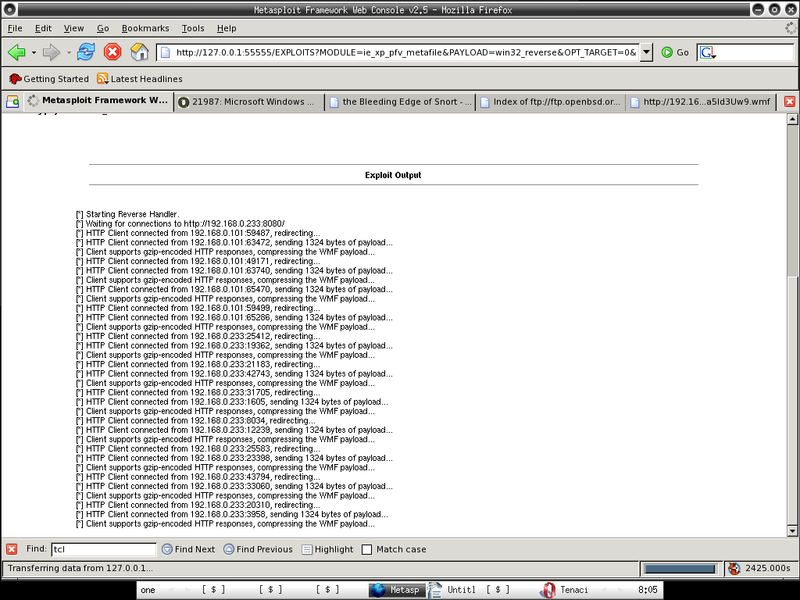 You may see the funny strings in the browser and it is executed without prompting any message. I have tried using Internet explorer and apparently I have same result as Firefox browser. It warns that the file is executable and you may save the file first before using it, this is apparently useful since you can scan it using your antivirus later if you have one. There are unofficial patches available out there, but normally users or corporate just choose to wait for the official patch from Microsoft. As a security or system administrator, you should send out notice to all the users to notify them since there will be worms in a wild before patch arrives. 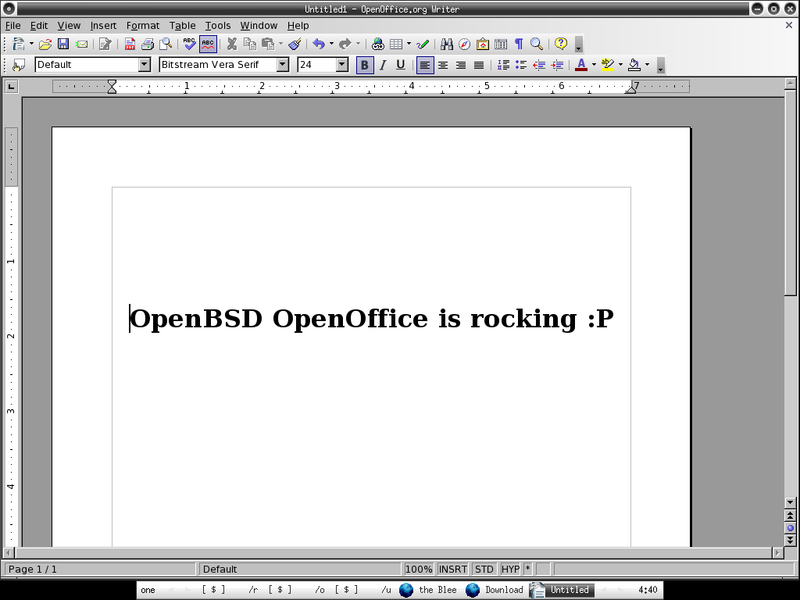 Finally I have OpenOffice 2.0 working on OpenBSD, nothing impressive but I'm happy with it since I can use OpenBSD as my workstation when everything I need is there and OO is one of that. 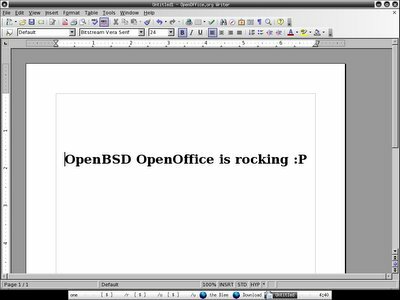 You can find how to install OpenOffice on OpenBSD here. 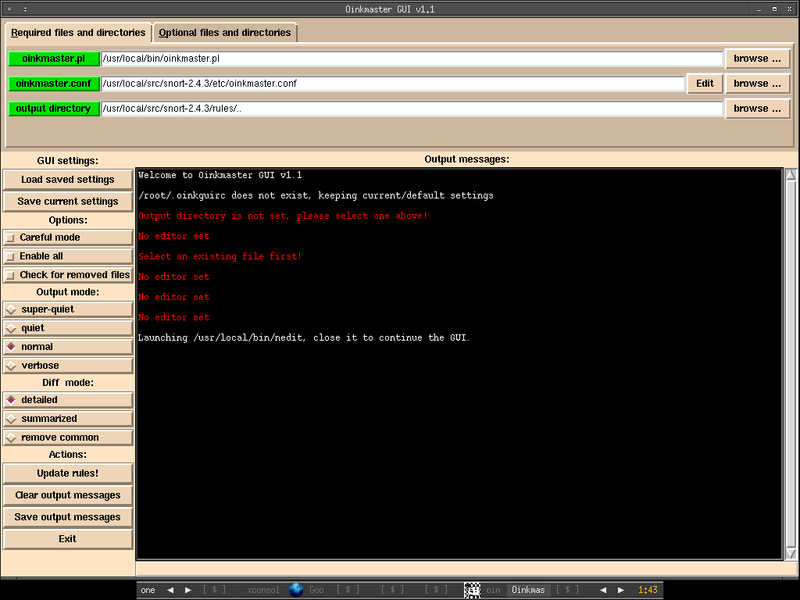 Below are the three screenshots that I have and I'm currently running OpenBSD Current. You may need to install Java Runtime Environment(JRE) or else it will keep saying can't find JRE. You can install it via /usr/ports/devel/jdk/1.4, remember don't install 1.5 since it doesn't has the plugin for firefox where you need it. You may have to download the jdk source manually and put it in /usr/ports/distfiles/. You can refer to /usr/ports/devel/jdk/1.4/distinfo to know what you should download manually. After finish the installation of jdk, you have to configure the JRE for OO manually, launch soffice and go to Tools->Options->Java->check on Use a Java runtime environment, then Add /usr/local/jdk-1.4.2/jre and you are done after restarting soffice.